IM Amon Simutowe is perhaps the brightest star to rise on the African horizon in a long time. This personable chess star from Zambia has almost single-handedly caused the world to take a second look at the African continent and the type of players that it is capable of producing. While countries like India and China are making waves in the international scene, Amon is just one of several young players making an impact throughout the world. This interview was conducted at the very end of his U.S. chess tour in which he participated in four tournaments in less than eight weeks! At the conclusion of the Wilbert Paige Memorial chess tournament, he granted an interview. A pleasure to talk to, Amon has an interest in economics and finance and is currently seeking his 3rd and final GM norm. The "Zambezi Shark" is Born! IM Amon Simutowe was born on the 6th of January in 1982. Nineteen years later, he would already eclipse many of the long-standing records for an African player. He is the strongest player south of the African Sahara and currently rated #3 on the continent. The young man who would become known as the "Zambezi Shark" was like many African boys who sought to prove their worth in the national sport of soccer. With his uncle having served as a coach on the National Team and also having coached one of the top four teams in the premier division, soccer was a natural attraction to young Amon. However, his life was changed forever when his brother (ten years his senior) would introduce him to the royal game of chess at the age of 10. After two months, his interest shifted to chess. His older brother saw a healthy appetite growing in his younger brother and began sending young Amon chess books and the British Chess magazine. Since chess materials were hard to come by in Zambia, Amon studied these magazines voraciously and two years later in 1994, he would enter his 1st of three local tournaments. "I really didn't do very well, but was praised as the best young player… under 16." A star was born! "In 1996, I won the National Championship (Junior & Senior). I didn't expect to win this tournament. . . I was just interested in qualifying for the Olympiad." The year of 1995 was a pivotal year for IM Simutowe. In that year, he won the under-21 National Championship at age 13! He went on to participate in the African Junior Championship that year and came in a respectable 5th place. When reflecting his results in 1996, Amon stated, "Appeared to be a great year for me." In this year, he shocked the Zambian chess establishment by winning the National Championship at age 14! "In 1996, I won the National Championship (Junior & Senior). I didn't expect to win this tournament. . . I was just interested in qualifying for the Olympiad." Well… he qualified but unfortunately the Zambian National team was unable to compete in the Olympiads. He earned the IM title at the 1998 African Zonal (zone 4.3) with the required 66% score and later went on to win the first of his two African Junior Championships. In 1999, he scored a whopping 12/13 followed by an 11/11 score in 2000. After successfully defending his title in 2000, Amon would continue his rise to prominence by finishing =2nd (8½-4½) at the 2000 World Junior Championships in Armenia, a tournament in which he carried the #42 seed. He also won the Southern African Zonal and posted good results in the British Championship and the British post-Olympiad tournament (=3rd). 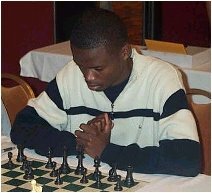 At year's end, he would finally get the chance to represent Zambia at the 2000 Olympiad at Istanbul and turned in an outstanding performance on board one with an 8-2 score, a 2600 performance rating, a GM norm, and a silver medal. In a year's time, his FIDE rating soared from 2240 to 2470 (it's currently 2462)! This type of increase in unusual in international chess, but of course, Amon is an unusually talented player. In this short time, he has picked up two GM norms (2000 Olympiad, 2000 African Championships) toward the three to become an International Grandmaster. would make a big difference." Seeking his 3rd GM norm, Amon has achieved this high level without a trainer, but states that he needs to add more theory to his opening repertoire. "I've been basically looking at chess magazines. That's why my (opening) theory is not so great. Right now I just follow tournaments." While Amon has a very magnetic personality and appears to be in good spirits, he reflects on his recent streak of poor results by saying, "If I can reorganize myself… that's all I need. I don't think it's mainly due to chess. I have to focus on what has gone wrong." While Amon doesn't have personal trainer, he asserts, " I think just getting a trainer in my view for a few weeks would make a big difference." Asked about the grooming of young talent in Africa, he states, "I think there are strong players everywhere… it's just how you bring them up… and whether they will get opportunities to improve their skills. I think almost everyone has got some talent. It's just a matter of how you organize and how much commitment one gives to the game." In the past 1½ years, Zambia's 2001 "Sportsmen of the Year" has participated in a number of international tournaments including: 2000 Olympiad (Turkey), Goodricke Invitational (India), Cappelle La Grande (France), Bad Wörishofen (Germany), Salou Costa Daurada (Spain), Olympic Masters (Switzerland), BCI Grand Prix (Angola), Smartchess.com (USA), Mayor's Cup (USA), the World Open (USA), Wilbert Paige Memorial (USA). Reflecting on the Wilbert Paige Memorial, Amon was candid in his response, "I think it's a very good tournament… especially the fact that it's historical. I've basically had a bad tournament. In the last few rounds, I was just waiting to get out of here!" <he laughs> Certainly, there was disappointment in his results, but he expressed hopes that the tournament can be organized next year, with additional tournaments featuring Grandmasters so that players can qualify for GM norms. Amon has sights set on a career in finance and economics, fields he considers "practical." Amon recently competed in the 2001 World Junior Championships in Greece (scoring 7-6) and will now prepare for the African Championships in Cairo, Egypt on 15-26th of September. Certainly, this future GM will have a lot of support in his quest for the lofty GM title. Best wishes to IM Amon Simutowe!